Japan's Unit 731 is one of the best kept and most horrifying secrets of World War II. Unit 731 experimented on Japanese and Chinese civilians as well as Russian and American POWs during the Second Sino-Japanese War in the 1930s and throughout World War II. The Japanese military actively sought biological and chemical weapons to use against China during the Second Second Sino-Japanese War, and later during World War II. Under General Shiro Ishii, a physician and officer in the Kwantung Army, Unit 731 conducted experiments on human subjects from China and Japan, with Russian and American prisoners of war along also becoming fodder for their sickening hypotheses. Ishii drew the eye of Emperor Hirohito in a demonstration where Ishii filtered his own urine and offered it to Hirohito, seen by Japanese citizens as deity, to drink. The emperor declined, but Ishii consumed the filtered urine with joy. A Japanese company later mass produced the filter, with Ishii receiving a portion of the profits. Unit 731 would come under the Epidemic Prevention and Water Purification Department of the Kwantung Army, through which Dr. Ishii received a substantial amount of funding from the Japanese government to spend on Unit 731. Under his orders, Unit 731 found a permanent home on a four-square-mile complex with hundreds of laboratories, a cinema, and its own railway line to go along with a crematorium and operating rooms. Vivisection of hundreds of civilians occurred on the campus, with a lack of anesthesia and a live specimen believed essential to this group of scientist soldiers due to their desire to study the body prior to decomposition. In addition to opening up the bodies, the scientists often removed organs to observe the effect on an individual. At least one experiment removed a prisoner's stomach and then connected the esophagus to the intestines of the subject. Unit 731 also performed forced inseminations and gave doses of syphilis under the guise of a vaccination. The group also observed how live human bodies froze in real time and how the body crumpled in extreme pressure experiments. Several successful attacks carried out by the Imperial Japanese Army used plans devised by Unit 731. The plan consisted of dropping ceramic pots containing rice and wheat mixed with fleas carrying the plague on villages in Southern China. The pots, attached to parachutes and tossed from planes, indirectly killed hundreds of thousands Chinese civilians. During the height of World War II, Unit 731 planned similar biological attacks for the United States. One early proposed mission involved a small kamikaze plane launched from a submarine that would unleash the plague upon the port of San Diego. The best defined plot, codenamed Cherry Blossoms at Night, aimed to infect the majority of California with the plague during one night in 1945. Another plot involved the use of 10,000 balloon bombs carrying incendiary devices to create forest fires as far inland as Michigan. As Russian and American forces pressed on Japanese soil in 1945, Unit 731 head Ishii initiated a massive cover-up; destroying several buildings on the Unit 731 campus and killing 150 captive subjects. Ishii also took steps to place former researchers in government or academic positions to maintain a modicum of control over their actions and words. United States General Douglas MacArthur gave vast the majority of scientists in Japan's Unit 731 immunity, but with a condition — MacArthur expected the scientists to share their secrets with the United States and no other member country of the Allied powers. Only 30 soldiers connected to Unit 731 went on to be tried for war crimes, with five sentenced to death in 1948 and the rest paroled by 1958. Dr. Ishii avoided any prison time and went on to perform weapons research and advising in the United States. With the passage of time, participants in Unit 731 are coming forward to tell their stories. Old men now speak of vivisecting young women in the Philippines in order to educate soldiers about female anatomy, as the Japanese military viewed the inhabitants as spies for the Allies. Toyo Ishii, a female nurse working for Unit 731, spoke of a watching human bone devoured by dogs before her eyes. Another elderly member of Unit 731 recounts viewing a display of a six-foot-tall Westerner cut in two pieces and preserved in a large vial of formaldehyde. 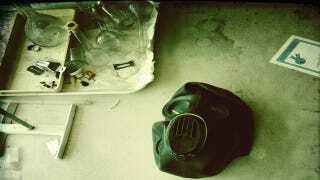 In time, physical remnants from Unit 731 have also surfaced. In 1989, routine construction work uncovered a mass grave holding the bones of Chinese individuals involved in bizarre experiments. Construction workers also found chemical weapons tied to Unit 731 buried underground in Heilongjiang, a Chinese province occupied by Japan until 1945. 49 workers have been injured trying to retrieve these remnants of war. Top image by billy2917 on DeviantArt. Images courtesy of Filip M.A./flickr, felibrilu/Flickr and Markus Källander/CC. Sources linked within the article.